Just One Hour… | Just Being Me! ← Where is time going??? What I have in mind if simple this. I would like to challenge all of you guys out there to take an hour to sit down and read your bible. Not a devotional, your bible. Just read. It doesn’t matter how fast you read or how slow. 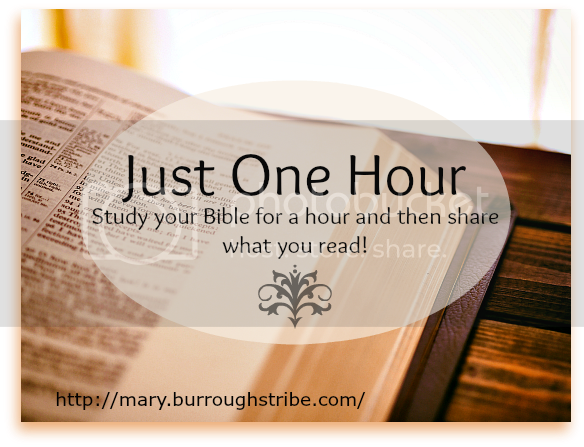 Then once you have finished reading your bible, blog (if you have a blog, or just share with someone) about what you read, and your thoughts on it. When will this be happening? Well, I know you guys have a life and so instead of set a particular date, I figured that I would set a week. The second week of June, the 5th to the 11th. If this is something you guys would like to do, please share this idea and get as many people interested as you can. I think it would be a lot of fun, and I would love to see how it works out for other people. So blog about this idea, pin the image. Tell you friends about it, or do nothing. I don’t care! This entry was posted in uncategorized and tagged Bible, challenge, Fun. Bookmark the permalink. Mary, this sounds awesome, I’m definitely joining the challenge! I do tons of Bible reading both for school and daily reading, so this shouldn’t be too hard for me 🙂 .